Close your eyes and open your ears because Gawgaw: a Panto in the Dark, is coming. Directors and writers Marta Vella and Vikesh Godhwani are interviewed by The Sunday Times of Malta. Marta: Gawgaw: Panto In The Dark is precisely what its title implies. It is a pantomime that takes place in complete darkness. The story is told using sound, touch, smell and taste and is a first as the actors will be performing live; the show is not pre-recorded. Vikesh: The story takes place on the days leading up to Christmas. Malta has been taken over by fear due to the rumours of il-Gawgaw roaming the streets, ready to pounce on its victims on Christmas Eve. However, is everything really what it seems? The show features an ambitious mayor, his scheming wife, a brave young boy, a creepy fortune teller, a priest with a funny name, a feminist dame and many other outlandish characters brought to life by a multitalented cast of four; Joseph Zammit, Davinia Hamilton, Samuel Farrugia and Chucky Bartolo as Dame. How did the idea to create a Pantomime in the dark come about? Marta: TeatruMalta approached us to do a Panto targeted for the visually impaired. We thought long and hard about how we can make a show which has such a specific formula like panto, inclusive and accessible. Unfortunately, what usually happens is that accessibility is an afterthought when doing a show. Therefore one ends up adapting a show to suit those needs. Instead we were adamant for inclusivity and accessibility to be the foundation of our show. We just figured out that the only way everyone in the audience can experience the same show is by doing it in pitch darkness. Vikesh: As Marta said, we wanted to be inclusive in our approach from the very inception of the show. The darkness was the only way in which everyone in the audience, irrespective of sight could have the same experience. It also opened a world of possibilities for us as creatives which was extremely exciting. You’ve been working in London for quite some time now, why come back to Malta? Marta: For us this was a no-brainer. We’re making a show for people who have never been able to go to the theatre because no one ever thought of creating a show for them. With this production, TeatruMalta has opened a door for accessible theatre. A door that should have been opened years ago. We are very grateful to be at the forefront of what will hopefully be a significant shift in the arts in Malta. Vikesh: Theatre in the dark has long been a fascination of mine. Getting the opportunity to create a piece in the dark for all the right reasons was an opportunity I couldn’t say no to. Plus, collaborating with Marta Vella after many years of not having worked together on a project, also excited my greatly! Why should audiences comes to see GawGaw? Vikesh: Panto has been a Christmas tradition for many Maltese families for years. Like with many traditions, however, panto might sometimes feel slighted dated and uninspired. What we’ve done with Gawgaw is taken something very traditional and invigorated it with new life by not only setting it in complete darkness but also using a Maltese myth as opposed to a classic fairy tale to tell our story. Of course, we’ve kept key elements like the dame (played by the hilarious Chucky Bartolo), the cheering and the booing and the song-sheet for panto aficionados, but there are plenty of surprises to excite even the biggest panto-hater. Marta: This is the first show of its kind. We’ve partnered with Esplora to turn the traditional Panto upside down using specialised technology bought down from the UK. Additionally, we’re also bringing to life a Maltese folk story that today’s generation probably isn’t familiar with. 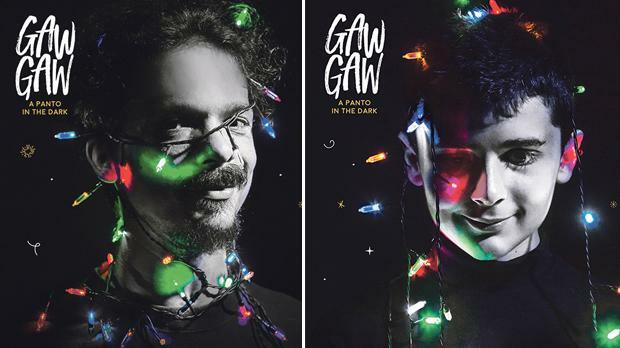 Gawgaw: Panto in the Dark takes place between December 19 and 23 at the Esplora Planeterium Hall, Kalkara. This production is an hour long and will be staged in complete darkness. The event is supported by Arts Council Malta. Tickets are available online or by calling 21220255.